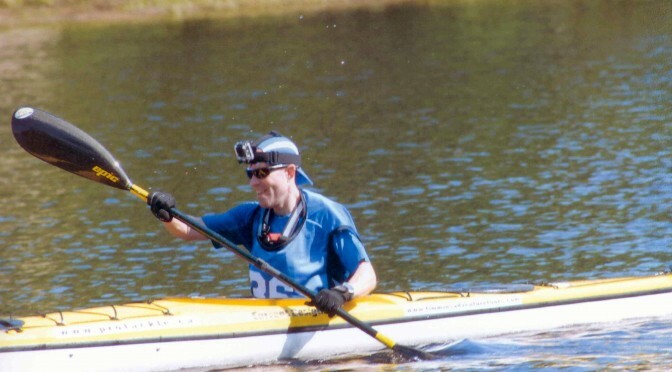 Welcome to another edition of ‘Where the heck is Steve, and what is he racing in this time?’ Well, the briefest of answers to that question is that I was in Timmins, Ontario racing in the Great Canadian Kayak Challenge, and covering said event for Get Out There Magazine. I have to admit right off the bat that this event was not on my radar earlier this year, and I didn’t really have the intention of making that kind of trip. However, when a cancellation came up, and it was offered up to me, I decided: What the heck? Why not? I like paddling, and I like traveling, so why not combine them together? And so this trip was hatched. Sadly, it would be a solo trip for me this time around, as I was flying up, and Deanna had other plans. I didn’t have time to snap too many pictures, but I did put together a whiz-bang video review once again, so please check it out! The trip was also a pretty much in-and-out kinda trip, so I couldn’t play tourist as much as I’d hoped. Right off the bat, I was faced with a few annoyances about my trip. I had booked the tickets months back, and even 12 hours before departure, my flight was confirmed AND I was checked in. Arriving at the airport at 6:40am, I learn my flight was cancelled from Ottawa to Toronto. Grrr. So, instead of arriving by 11:30am, I’d be touching down well after 6pm. Not only that, but due to work commitments, I was forced to stay in the airport all day and work over free wi-fi and take conference calls. Not ideal. I could have driven up quicker than the time it actually took me to get there. Oh well, I’d rather they ground a plane with mechanical issues than put me on it I suppose! I wandered into town to see the race venue and grab a bite to eat at Boston Pizza (side note: BP is quickly going the East Side Mario route to me, meaning AVOID). Washed my meal down with a beer, and wandered back to hotel. The kayak race was more of a festival, and while paddling was a central theme, it was by far not the only thing going this weekend. There were events for the whole family all weekend, and the town is rapidly turning this into THE biggest yearly event in Timmins, and I must say, I think they are on the right track promoting healthy living in this way. Next morning, I arrived on site pretty early, as I had to pick up a boat I was borrowing for the race. I had reached out to Shawn from Timmins Adventure Tours in the lead-up, and he had graciously offered up a craft for me to use. Shawn runs a number of businesses, including a paddling outfitter, tackle shop, and lots of other outdoor products. He is a really energetic guy, and also runs the local boxing club. It was great meeting him and chatting about life in Timmins. Plus, when he learned I was racing in the ‘elite’ division, he didn’t hesitate to pull down his very own racing boat to loan. Once he was convinced I wasn’t a total amateur, I was off. If you’re in Timmins, and need some gear for outdoor pursuits, make Shawn and his folks your first stop! He’ll go out of his way to help, and with a smile. The Great Canadian Kayak Challenge is not one event, but a whole slew of events, starting with the Elite 35km Challenge starting at 9am Saturday, and ending with sprint events on Sunday afternoon, and all distances between. I was in the 2nd most competitive event, the ‘elite recreational’ 16km race departing at 10am. This one of the few races I’ve entered that actually has a healthy purse, with prize money awarded in pretty much every single race 5-deep for both men and women. It added an interesting dimension to the front of the race. Obviously, my eye was on victory, but it wasn’t long before I was humbled in the water, and realized that there are people that paddle more than 4 times in a season and actually focus on paddling. That being said, I did have a good race. Although the raw numbers in each event were pretty low, the overall participation has been steadily going up every year in this events’ 5-year history, and should continue to grow. Especially given all the media exposure they are getting. While I was considered ‘media’ as well, there were tons of others there, including live-to-satellite coverage from Eastlink. There was also a HUGE production crew of professionals shooting for Ontario Tourism for the purpose of commercials. They had a really expensive drone in the air covering the race, as well as boat crews with fancy water-ready camera gear in the thick of it. I’m sure they’ll distill their hours of footage into 15 seconds as part of a bigger commercial, but WOW! Talk about a big crew. I was a small fish out there. On the plus side, there WAS a ‘media boat’ so I got to go out for a cruise on my own on a party boat to do some filming, which was fun. Right, how about the race? Let’s get back to that. As is usual in events like this, racers were sort of sizing each other up by looking at the boats and gear of everyone. Seeing the camera on my head, I was asked if I was actually racing or just filming. I assured them I was racing, hence my fancy paddle and gear. There may have only been 7 men in my grouping, but they were all pretty well kitted and proficient. When the starting gun went off promptly at 10am, we took off in a hurry under a blazing hot sun. I’d taken 1L of hydration, but ran out about 2/3rds through the race. Not long after the start, the front 2 guys in Epic boats were already building a big lead on the rest of us. In the first 4k of the race, I was in a nice little grouping of 4 guys (including me) and 1 lady. We tried to do a little drafting and staying together. I secretly hoped they’d gone out too fast, but it turns out that might have been me! I found I had to push hard just to stay with them. Eventually 1 guy and the lady pulled away, leaving me in a group of 3 guys. I started falling back a little bit and worried for my chances. I was now sitting in 6th place, which was off the podium, and in my mind, unacceptable. I wanted to bring honour to Shawn for lending me his nice Stratus to race in. Our first part of the race was downriver, with the wind at our backs. Once we hit the buoy turnaround, the refreshing wind hit our faces, and the real work began. Essentially, we paddled 2.5k downriver, then 9k upriver, only to turn another buoy and finish the race with a 5.5k downriver run. Anyway, now that the wind was in my face, I started feeling a bit more refreshed and energized. I slowly but surely starting eating into the lead the guy ahead of me had. Eventually, I overtook him. That put me in 5th place. I set my sights on 4th and stayed focused. He seemed to always stay just out of reach. Another 5k or so of paddling, and I was surprised by a flash of yellow on my right. Dude I had passed got a fresh set of arms and passed me! Turns out, his shoulder had been hurt, but he popped it back in and found his mojo (or so I learned after the finish)! Filled with fire again, I charged after him to try and keep up. After all, I had already passed him, so why was I losing ground? The good news is that this effort actually caught us up to 4th place, which my guy then handily passed too! Of course, as you can imagine, this ignited the other dudes’ fires, and he pressed on hard. By this time, we had just made the final turn, and had the 5.5k downriver finish run to do. That worried me, as I seemed to lose ground downriver. Not giving an inch though, I kept paddling hard, determined to get back to 5th place. The real challenge now was that I was over-heating and had run out of water. I’d have to dig deep and enter the pain cave to pull this off. It seems a little silly to have such a perceived battle for 5th, but that’s the way the competitive spirit works, right? Mustering what I could, I found a good cadence and kept at it. However, when I finally got broadside of this fellow, he also turned up the jets, pulling slightly ahead again. I wasn’t until the final bend in the river, with about 500m to go, that I found an opportunity again. I took the inside corner, pulling up broadside once again. Only this time, I decided to go for broke. I put on the blinders and put everything I had into my final sprint. I’m not an adept paddler, and am not really sure how to execute a sprint, but I tried anyway. I hunched over, dug my paddle deep in the water, and went into the redzone, complete with audible grunting and breathlessness. It worked, and I pulled ahead and stayed ahead by a couple boatlengths, just to take that final podium place! My little group of 3 all congratulated each other on a well-fought race, and then essentially went our separate ways. There were no hard feelings, as we had all worked hard for that final part of the race. In fact, the guy did comment that it was fun pushing to keep up with me! Although my race was over before noon, the overall awards wouldn’t be until 5pm that day, so I spent the rest of my day hanging around the festival grounds taking it all in. As mentioned, I also went out for a cruise to watch a 5k race in progress. Eventually, I walked back to the hotel to shower and change before heading back for the awards. Once back onsite, I helped myself to some BBQ grub as well as a couple celebratory malted beverages. Although clouds had started rolling in, the weather was still thankfully holding out. This was a good thing, as later that evening, the party was set to start up, with live bands, a big beer gardens, and fireworks! I collected my medal and award with a big smile, and stuck around a little longer for draw prizes. At one point, my name was called for a camp chair, but I decided to just pretend I wasn’t there. After all, checking the chair with my luggage would cost more than it was worth! After the awards were over, I made an impulsive decision to pamper myself in the early evening. How so? Well, my hotel was called Cedar Meadows Resort and SPA for a reason. The spa portion was actually a Nordic baths kinda deal, like Le Nordik in Chelsea. For a mere $25+tax, I had full access to all the facilities. Seemed like a plan to me, seeing as I didn’t really know anyone, and the first few bands back at the festival were going to be country-oriented. Once back at the hotel, I spent the next 2.5 hours alternating between hot treatments, cold treatments, and relaxation. It was pretty awesome. When I finally dragged myself out and had a shower, I felt super relaxed and my skin was all squeaky clean. I should also mention that earlier in the day I had also opted for a free chiropractic treatment. A spine adjustment if you will. So all told, I was mellow and relaxed. The thought of heading back to a rowdy beer gardens didn’t quite appeal, so I decided instead to stick around the resort, and just head out for a solo nature walk to check out the fireworks. I’ve gotta say, they were actually really good. Much bigger than I had expected from a relatively small town. Even from the resort, I could hear the bands raging on, and could only imagine the quantities of beer being consumed down there! I was quite happy to buy a bit of junk food, retreat back to my room and watch ‘The Dark Knight’ on TV. I’d had a good day, and didn’t want the end of my trip to involve elbowing my way through drunk locals! The next morning, I got up at a reasonable hour, and headed down to the hotel gym for a nice treadmill run. Why treadmill? Well, it was pouring cats and dogs outside, and I didn’t feel like running in the cold and wet, only to pack my wet clothes into my bag for the flight home. I put in a good hour and a half, showered, then treated myself to a great brunch buffet in the restaurant before grabbing a cab and heading home. All in all, a great weekend experience, and frankly, if I was a paddler with a family, I think that this event would make a great destination race for the closing days of summer. The atmosphere was very family friendly, the river very forgiving for a paddler, and just the right distance away to make it feel like a worthy road trip! For me however, it wasn’t the last race of the summer. 2 weeks to go till my final event, a 65km trail running race with 2,000+m of climbing! Check back in a while for that report. Sorry for the delay in getting this post up everyone. In the past 10 weeks, I’ve done 8 races, and between the pictures, the videos, the training, the racing, the editing, the working, etc. etc, I just ran out of time to write my traditional post-race summary 🙂 However, I’m here tonight to rectify that and share with you all just a few thoughts from the Gatineau Loppet this year. I was particularly excited to take part in the event this year, as it would be my first time taking part in a longish race where I skate skied! Yes, this is still my first year on skate skis, so there is still a lot to learn, but it didn’t stop me from signing up to do the 31km (eventually classified as 27.5km) event at the Loppet. I was also there covering the event for Get Out There Magazine, so as has been the case quite frequently lately, I have a video review of the race for all to enjoy at the end of this post too. In addition to the video, I snapped a fair number of pictures over the weekend for you to check out. Click on to read the rest of my thoughts on the weekend, which I’ll keep on the brief side. The first thing I’ll note (and no, it’s not totally an excuse) is that the Loppet fell exactly 1 week after my completion of the Canadian Ski Marathon, where I skied 160km classic style in 2 days. I’m no expert here, but I’m willing to bet that 6 days is not a sufficient amount of time to fully recover from such an event, especially in light of the lack of training I put into that event! So, strike 1 was no recovery from CSM, strike 2 was the fact that I’m pretty much a rank amateur. Strike 3? Easy, there is no strike 3. I make no excuses for my performance at the Loppet. In fact, I really didn’t care how I really did in the event. I’ll say this much. When I did cross the finish line at the finish, I was completely satisfied, and think I did a great job. By the numbers, I was 20/22 in my category! And 161/213 for men. Yup, pretty low down in the standings. But I’m getting ahead of the story, aren’t I? Let’s rewind and actually have a look at the race prep and action. Now, let’s be honest here. My desire certainly wasn’t to be that far down the rankings. I’m not boasting here, but that’s not a spot I’m used to being in during a race. Particularly where nothing actually went wrong. I even tried to help myself by having my skis professionally prepped for the race. Ok, not a real professional prep, but I did at least drop them off at a shop for tuning rather than doing them myself. A nice wax job of molybdenum low fluoro for the first layer, scraped and brushed, followed by another top coat of low fluoro scraped and brushed. Sound like Greek to you? No worries, it just means I had then nicely waxed to be fast and slippery in the snow conditions we were expecting. And they WERE good. I had great glide the whole time. The weather was also pretty ideal. Blue skies and the works. 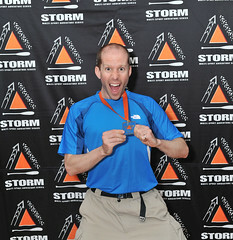 The wind picked up a few times during the race, but overall, I was pretty comfortable. So off to the start line we go! Lucky for me, I had seeded myself pretty far back in the race. I was in wave D, with a planned completion time of around 2hours. Nothing spectacular, but a nice, realistic goal. The starting gun sounded, and all around me we were double-poling like mad to get to the line where we could start skating. However, with the crowds and some hills, it was a little while before I could actually finally try some skate strides. Around me, people were stepping on other folks’ skis, falling, etc. One poor guy had his carbon fiber pole snap like a twig under the weight of another skiers ski. I felt bad, and made a note to make sure I kept my poles to myself. Once I started hitting the more open areas, I got myself into a nice rhythm and focused on trying to pull out a good technique. I’d like to think I was doing a fairly reasonable job of that, but the video playback definitely showed me some points I could improve on. Deanna had been nice enough to do some filming, and there was a spot where she caught all the front crowd, and eventually, me. Because of that, I had great reference footage of good, average, and bad technique. I placed myself into the ‘average’ category. Weight shift yes, but too short a glide phase. The course itself was a real treat. Good mix of different trails. Some parkways, some fields, and of course, some nasty little climbs, including the ever-popular climb up to Pink Lake from the backside. Trust me, it’s a great trail to practice your climbing. We also managed to grab a trail I was completely unfamiliar with, which I think was the #15 heading left off the parkway up towards MacKenzie King after the T intersection. This was a nice narrow, climbing, twisting trail where I got to do a lot of practice. While I had started fairly far back, I felt good about the fact that I was seldom passed on the trails. On the contrary, I was doing my fair share of passing. In other words, I was holding my own in my start wave. It happened in the stupidest of spots. Completely flat and skiing smoothly along the parkway. I was a little surprised to see a cyclist heading towards me! Yup, on a mountain bike with knobby tires, this joker was just riding along the ski course heading towards me. Luckily, it’s very wide, and there was absolutely no problem. However, afterwards, as I kept going, my mind wandered a bit, and before I knew it, I planted my pole in front of my ski, causing a nice tumble in front of a couple others. I got up lightening fast, but quite embarrassed. After making it through all the technical bits, this was a blow to my ego. However, with only a few kilometers to go, I could care less. I finished out the race uneventfully, having a great time in the sun on a gorgeous winter day. Deanna was waiting for me at the finish, and I did my best flying bird impression on the final 100m stretch, by flapping my arms. Nearly fell again, but I was a happy camper. My final time was 1hr 50, so I had beat my goal, although with the adjusted distance, I was actually pretty much right on track. I hung around for a bit for the podium ceremony for the top 51km race finishers, then had a bite to eat, then headed home with Deanna so I could work on the video. All in all, another brilliant race day and a good result for my first long skate ski race. Although I really love skate skiing, I’m not sure I want to race again. It’s a bit maddening to be soooo much slower than others. I suppose with practice and training…. Who knows. Stay tuned to see if I try again next year I guess! That’s it for now. Next up: Snowy ride to Quebec for the Pentathlon des Neiges… Adios amigos.